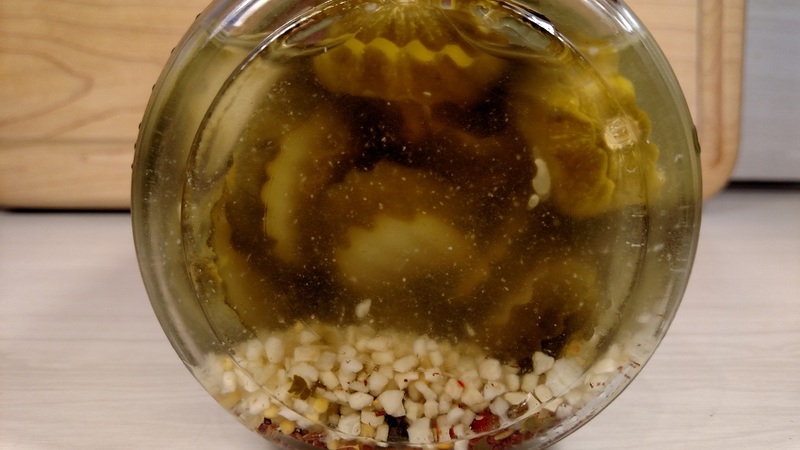 For our first article of 2016, we bring you PICKLES! Way to start the new year off with a bang, eh?? Let’s get this out of the way. Yes, we are going to be constantly referring to pickles. Yes, we are immature and see the humor. So once and for all…PICKLES (HO HO!). There, now we can be civilized humans for the rest of the article. Herman found these while browsing through the grocery store. He does that a lot. He actually has to put down his beer long enough to go to the store, so for this he gets some credit. 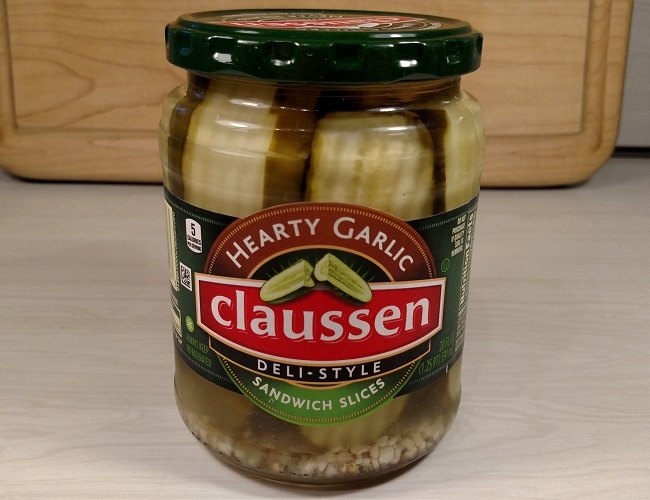 We all know what Claussen pickles are, right? We think they are the best pickles around that you can get anywhere. Sure, there are some good local pickles out there. But, Claussen can be had all over the place. Plus, Claussen pickles are the fresh, crisp, deli kind of pickles. They need to be refrigerated, and they are kept cold in the store, too. Regular pickles are different. You know, they are the kind that have that funny green color. And they don’t need to be refrigerated until opened. Creepy. That said, both of us like Vlasic pickles sometimes. They have their place. For everyday pickle eating (we are really trying here, people! ), we think Claussen are the best. First though, you must know a couple of things. Herman is a garlic fanatic. He uses a LOT of garlic. Seriously people, a LOT. And he puts it in everything, just about. It was no surprise to Denny that Herman picked these up to try. Further, you may be wondering why we are reviewing the sandwich pickles and not the regular ones. Again, blame Herman. He puts pickles on sandwiches. Denny does not. Still though, Denny will eat sandwich pickles if that is all that is available. Herman wins. So sandwich pickles it is! Oh look, the top of the jar! Herman went through a scientific process to get all of the stuff in the jar to the bottom for this pic. By process, we mean he tipped the jar. He’s a scientist, you see. Anyway, take a look at all that stuff. See extra garlic?? You decide. And there you have it. 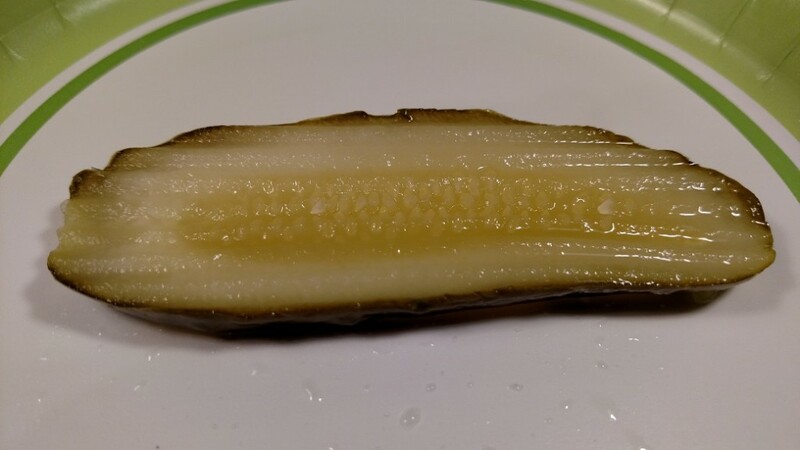 A sandwich pickle! Here’s the bottom line, people. These pickles pretty much taste exactly like regular Claussen pickles! We couldn’t believe it. We expected a pretty heavy garlic flavor, because, after all, they are called HEARTY GARLIC. But, no. It wasn’t to be. We cannot stress this enough. There is virtually no difference between these and the regular ones. Nothing. Zip. Nada. We will say that we think we can detect a little more garlic flavor. But we suspect that is only because we know they are supposed to be “hearty garlic.” If we tried these in a blind taste test, we wouldn’t be able to tell. We would think these are regular Claussen pickles. Since we couldn’t taste much garlic, Herman looked up the list of ingredients of these and regular Claussens. Get a load of this. Right from Kraft’s website, here is the ingredients list of the Hearty Garlic pickles: FRESH CUCUMBERS, WATER, SALT, DISTILLED VINEGAR,CONTAINS LESS THAN 2% OF DRIED GARLIC, CITRIC ACID, CALCIUMCHLORIDE, SPICE, SODIUM BENZOATE (TO PRESERVE FLAVOR), MUSTARDSEED, NATURAL FLAVOR, DRIED RED PEPPERS, POLYSORBATE 80. 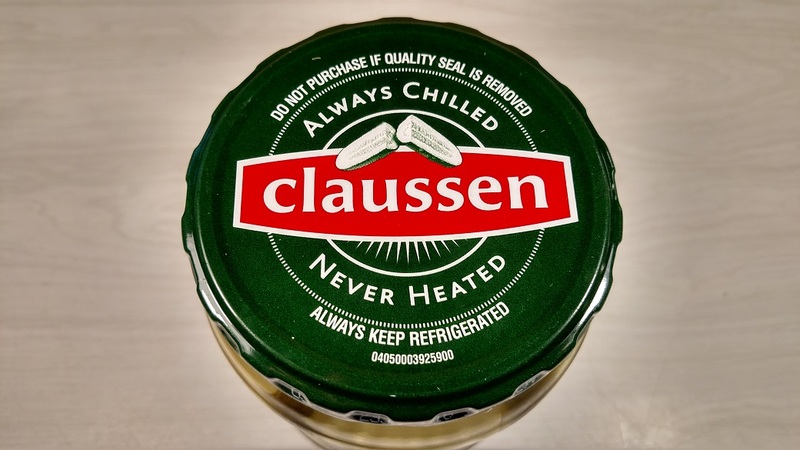 Here is the list from Kraft’s site of the regular Claussens: FRESH CUCUMBERS, WATER, DISTILLED VINEGAR, SALT, CONTAINS LESS THAN 2% OF HIGH FRUCTOSE CORN SYRUP, DRIED GARLIC, CALCIUM CHLORIDE, SPICE, SODIUM BENZOATE (TO PRESERVE FLAVOR), MUSTARD SEED, DRIED RED BELL PEPPERS, NATURAL FLAVOR, POLYSORBATE 80. OK, people. There isn’t much more garlic in the HEARTY GARLIC ones than the regular ones! No wonder we can’t taste a difference!! WTF?? It isn’t like we are out anything. They cost the same as a regular jar. And they will be eaten, because they are basically regular Claussen pickles. But, when we expected extra garlic and didn’t get it, that is disappointing. Herman was particularly disappointed. So, stick with the regular ones. There isn’t any point in buying these. Only buy these if the store is out of the regular ones. Or, buy them if you want to get mind screwed. Happy 2016 with pickles, people!